About a month ago, I saw a poster advertising an event at Humanity for Wednesday, August 15th. It summarized the aim of the workshop as “Shifting Energy Patterns”. I felt excited as soon as I saw the poster and I knew I had to take the class. Later that day, I went on to Tracey’s website and read up on her work, and discovered her main talent was “programming” crystal pendants to assist with energy shifts. I’d never heard of such a thing… but I was intrigued. I’ve said before that I was never really into crystals, cauldrons, that sort of thing. I briefly explored the magical branch of wiccan / pagan tradition, and I found myself feeling distinctly that a lot of the shops that sold things like crystals, ritual silver daggers, specialized herbs and other supplies for the modern witch, were really just capitalizing on a spiritual trend. 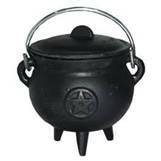 I intuitively knew that intention makes an object or a place sacred, and that you don’t have to start with a $100 cast iron cauldron. You can use any cooking pot – the original energy workers never had the luxury of disposable income to blow on fancy supplies. Oh, I’ve purchased a couple of sun-catcher crystals, to make rainbows dance across my living room in summer. I wore an amber necklace for a year, aware of it making me feel grounded and protected… but I’d never investigated further. It was Candis, the woman who facilitates our weekly crystal meditations who really opened the door on crystals for me. I gave her a reading once, and she gave me a Szechuan Quartz, explaining she’d charged it in the light of the last full lunar eclipse, during winter solstice. It was a plain, unassuming stone and I put it in my pocket. After carrying that stone with me for a week, I found myself growing really fond of it. I noticed a big difference in the depth and clarity of my nightly meditations with George. I expressed my worry to Candis that I’d lose it, and she wrapped it in copper wire for me so that it would hang as a pendant off of a leather thong I’d found. If you get *any* book about crystals, get that book. I’ve referred to it hundreds of times in the last six months. I’m so grateful for the copy I acquired during the last “Books for Readings” blog event. 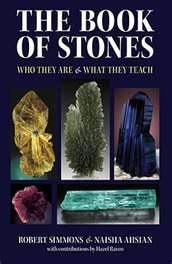 In the Book of Stones, I was amazed to discover the Szechuan Quartz was particularly useful for psychic attunement and development, as well as balancing energy flow, balancing chakras and Connecting with heaven and remaining grounded. It was exactly the stone I needed. That started it. Since then, I’ve attended the crystal meditations as often as I can, and I’ve done readings from the stones themselves. It’s often surprising the information I’ll get from a stone – sometimes I’ll hear a sound or see colours, or become aware of how the stone affects my body. Other times I get information as though the stone itself is speaking. Usually the information I relay corresponds with information from the Book of Stones. Candis has an extensive collection of crystals, and I’ve had the opportunity to handle all sorts of interesting stones from Herkimure diamonds, Lemurian seed crystals, Moldavite, locally collected geodes, gold nuggets, hematite and jade. I tell ya, I’ve become a crystal enthusiast. This is why I was so open to investigating this idea of programmed energy-shifting pendants. I doubt I’d have been open to it a year ago, and I might have written it off as one of those money-making new age schemes. Anyway. After reading about Tracey’s work on her website I decided that I would learn a lot more from her and the workshop if I experienced the energy shifting pendants for myself, so I called her up and we booked a phone appointment. During the appointment, she asked my body to give a signal for yes, and a different one for no. The response will be different for everyone. In my case, my “yes” is my eyelid involuntary raising, and my “no” is my toe twitching. I should clarify the issue: I wanted to address what I sensed to be an energy block connected with my chronic shoulder pain, jaw clenching, headaches, sinus infections, as well as the mysterious symptom of me becoming near-mute after marathon-readings (even though my physical voice was not strained) and I also sensed this was tied into my money issues – anxiety relating to money, ability to welcome more money into my life. Well, the first thing Tracey said to me on the phone was “These are all separate issues,” and my heart sank a bit. I *knew* they were connected. But then, Tracey looked at my energy intuitively and said it actually looked like there was one single issue, but like a hand, it had fingers reaching out into many aspects of my life. Yes, that is the block I want to address. We did a few more confirmations, and yep, that was my pendant. Once the pendant was selected, Tracey continued the yes/no process to find “supports” for the body. These supports are random, inexpensive objects like pins, buttons, glass beads, which are programmed for things like unconditional love, grounding, emotional soothing etc., support you may need while experiencing the often-uncomfortable adjustment to the new energy patterns. Once the supports were chosen, Tracey said she would place the pendant on me “energetically” and that I was likely to begin experiencing the effects the next day. She said that some people find them “heavy” or experience fatigue for the first few days. The very next day, I received a call from a random person offering to buy our dead chevy cavalier. This is a vehicle we would have had to pay to dispose of when we move, but here someone was offering us money to solve a problem. Neat eh? It’s not a big influx of money, but it illustrates a shift. Painful as it was to work through, the friendship that week ended is one I was glad to release. I’ve also consciously decided to let another friendship go, someone I wasn’t that close to but who is always in one sort of crisis or another, wanting me to bear witness to the soap opera of her life. I didn’t realize how draining it was for me. I began to notice a lot of ways I was giving away my energy and resources – no wonder I’m always so tired. This is a photo of my pendant. This thing keeps surprising me, almost as though it has a life of its own. I didn’t take this photo myself, I got it off of Tracey’s website. Ironically, although she had hundreds of pre-made pendants, my pendant was one of the ones selected to appear on her blurb of inner-shifting pendants: http://awakening-thehealerwithin.com/offerings/pendants/ I would have seen it when I was reading her website. I know it’s this precise pendant, because the shape of the stones, the break at the top of the stone, the crossing and wrapping of the lower stone are all exactly the same. There’s no way it’s any other piece – there are a number of distinguishing features. In graceful synchronicity, Heaven had managed to guide Tracey to program it with exactly the intention / energy shifting pattern I required. It’s a super-powered pendant I’m certain was created just for me. This crystal’s energy is particularly strong within the higher chakras, and this vibration has a powerful action to aid your communication abilities. They are excellent stones to aid you to speak more easily and more truthfully with those with whom you may have relationships. 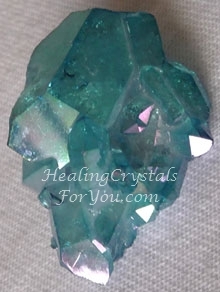 The lovely blue color of Aqua Aura Quartz is a clue to their strong capacity to aid your emotions and help you to feel calmer and more at peace emotionally. The vibration of these bright blue crystals is particularly active at the throat chakra… and it is also quite potent within the thymus chakra and heart chakra… aiding heartfelt communication with others. They are known to aid you to let go of perceived limitations you may feel, and be able to speak the truth without fear. Their high vibration relates to the alchemical method used to bond the gold onto the quartz. This energy resonates within all of the higher chakras to aid you to connect with spirit and understand their communication with you more clearly. are strong stones for psychic protection and they will prevent any negative effects from any type of energy you may connect with. Use them to do a psychic meditation… as they may also aid you to be able to develop psychic abilities… as they have a strong energy in the higher chakras. By stimulating the third eye area and the throat chakra, these stones may aid you to develop psychic communication gifts. Their energy in this area may also stimulate the gift of psychic hearing, also known as clairaudience. They are strong stones to aid you to develop automatic writing and channeling abilities (this is something I’ve been working to develop and have actively been asking for help.) They are a very beautiful stone and would be powerful to wear… although maybe only for short periods at first as they have such an intense energy. In the first few days of wearing my pendant physically, I started to feel really fatigued again – that kind of tired you get when you have a cold coming on, or your period – the kind of fatigue pregnant women in their first trimester describe. I took it off at night for the first few nights, but now I feel quite comfortable wearing it all the time. Tracey revealed to me later that the only reason she’d travelled eight hours to give a workshop in our tiny town (and she couldn’t have made more than a couple hundred dollars on the trip, probably enough to break even on gas and ferry costs) was because she’d received a powerful vision to come over here to teach. She also told me about her dream to start a school for psychic children, which included the helping and healing teachings of animals. I had also initiated contact with Linda Keen, author of John Lennon in Heaven, not because of our mutual contact with John, but because one of her friends in heaven came to my house and specifically asked me to contact “the woman who wrote John’s book” about a school for psychic children. It turned out that Linda had actually founded her own school for psychic development with her husband in the Netherlands. Linda, for anyone who’s not aware of her, is also a wonderful lady, and an incredibly powerful distance healer. Without her assistance shortly after Mocha’s death, I’m sure I’d have been torn apart by grief for months. I don’t know exactly how she helped to close over that hole in my chest, but she did, and I was able to gently mourn the loss of my dog friend, rather than partially die myself. I don’t know how this is all going to wrap together, but obviously, it’s going somewhere. Care to chime in on Heaven’s plans for us John? And spoil the surprise darling? NEVER! Prat. J Love you anyway, my friend. As for the workshop itself, it was interesting. I believe I learned more by experiencing the pendant, than by attending the workshop, and I understand now how I will “program” crystals myself, although Tracey herself actually didn’t teach us her method. Stand on the floor with your feet comfortably apart. 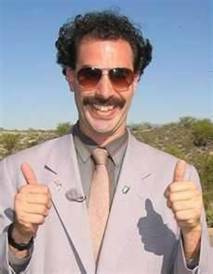 Hold your arm straight out in front of you and make the thumbs up sign. Kind of like that… but less 80s. Yeah, like that, but just one thumb. 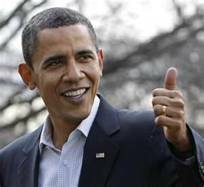 Obama’s almost got it – just straighten that elbow. Close your eyes. Then, keeping your feet in place, rotate your arm and torso as though you’re trying to give the thumbs up to someone behind you. Move your thumbs up arm as far back as is comfortable, then open your eyes and mark where your thumb is on the wall. Hopefully there’s a photo or a piece of furniture there. Next, repeat the exercise but with your eyes open. See how much further back your thumb will go? Tracey said this demonstrates how much more willing the conscious mind was to change than the unconscious mind. I don’t know about that conclusion, but the exercise itself was interesting. I feel it demonstrates the willingness of our brains, when engaged with the environment, to push our bodies past the natural comfort level we have when we’re looking inward, rather than outwards. If anything, it’s a reason to meditate, to engage in that inward comfort level and perhaps adjust your boundaries to be closer to where your inner self wants to be. When your eyes are open, you try to get farther. When your eyes are closed, you’re listening to your body first. There were a few exercises like that. Then we got on to the programmed bottles of water, which Tracey said address the “first layer” of an issue. I don’t exactly know what that means, but I think it means you get a bit of a push or a kick in the right direction, but it’s not as powerful an experience as the crystals. Three volunteers selected bottles of water using the “yes/no” technique I used to select my pendant. The really cool thing about watching this process from the outside was that my own body was answering yes or no just moments before the volunteer would say yes or no. I was right every single time. I realized that my body was psychically reading the energies at work with the water, the issue and the volunteer. It’s a whole new way to read, and I’m not sure how I’ll use it yet. Tracey, just like the rest of us, is a human being and she is not perfect. Neither am I, and so I find comfort in the company of other imperfect human beings. Honestly, I was fairly put-off by Tracey after our first phone conversation. Maybe it was this “patient-doctor” dynamic. Tracey started to read my energy without asking for permission (although she teaches asking permission in the workshop, so she must have forgotten to ask.) When that happened, my own psychic protection prickled, and I voluntarily let her in, although I felt a bit annoyed. I also felt annoyed when Tracey asked me to talk to all my friends about the pendant, so that she could have a few more paying clients when she came up to visit. There was no way I was going to talk about something I hadn’t experienced for myself, and I felt it was really nervy to ask me to drum up some business for her… but I found myself raving about Tracey to mutual friends just a week later, and I did my best to ensure that as many of my friends as possible attended the workshop. One friend arranged her own energy-shifting appointment, and her body selected not one of the $200 pendants, but a $100 unconditional love pendant. Tracey refunded half her money and honored her body’s choice, demonstrating her strong ethical practices. My friend was so powerfully moved by her experience that she started crying when she read the description of the unconditional love pendants later that evening. It’s interesting to note that feeling annoyed is one of the first responses you can experience when you’re addressing a block with the intention of shifting it, so I wouldn’t be surprised if others felt like they were getting pushed or prickled by Tracey in some way. Now that I’ve gotten a chance to know Tracey, I can honestly say she’s a powerful healer and incredibly good at what she does… I do feel like I need to tell people to just cut her some slack initially. I’m really glad I did – I almost blocked the pendant from working shortly after the appointment, when I sensed her put it on me energetically. I almost called Tracey to cancel the whole thing. I decided to just go with it to see what happens, and the results are so powerfully felt, but difficult to describe. My best advice: If you’re ready, just try it. Let the pendants speak for themselves.